Hematology and Oncology Ward, Mofid Children’s Hospital, Shahid Beheshti University of Medical Sciences, Tehran, Iran. 2Pathology Ward, Mofid Children’s Hospital, Shahid Beheshti University of Medical Sciences, Tehran, Iran. Pour KG, Moradvaesi B, Nouri M, Khoddami M, Jadali F. Intra-Abdominal Lymphangiomatosis with Bone Marrow Involvement in a 7-Year Old Girl: A Case Report. Oman Med J 2013 Mar; 28(2). Lymphangiomas are rare tumors. When they occur at different locations, they are referred to as lymphangiomatosis. Here we describe a case of lymphangiomatosis presenting with chronic diarrhea and failure to thrive. Etiology, clinical presentations and treatment options will be discussed. Keywords: Lymphangiomatosis; Tumor; Parenchymal; Propranolol. Intra-abdominal lymphangioma is a rare tumor with 90% of cases presenting at the age of less than 3 years.1 They have an equal prevalence between males and females in childhood.2 The common sites for lymphangiomas among the younger individuals are head, neck (these two comprise 50% of cases), axillae, or sometimes the parenchymal organs such as the liver. At times, they can occur at different foci and this is referred to as lymphangiomatosis.3,4 These are benign tumors, but due to their large size and the fact that they can occur in critical locations and become infected, they can cause significant mortality.5 Herein, we describe a case of systemic lymphangiomatosis in a 7-year-old Afghani girl, whose abdominal pain persisted after surgery but responded to treatment with propranolol. 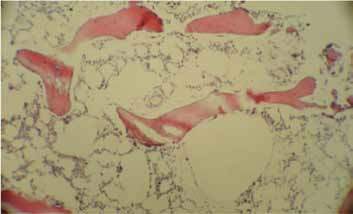 Histopathological examination showed dilation and proliferation of lymphatics, muscular layer hypertrophy and fibro-adipose inflammation. This confirmed the diagnosis of lymphangiomatosis. According to our patient’s age and clinical presentation, the main differential diagnosis was lymphoma. The other differential diagnosis was diffuse hemangioma, which can mimic the clinical presentation of the current case with abdominal mass and abdominal pain. 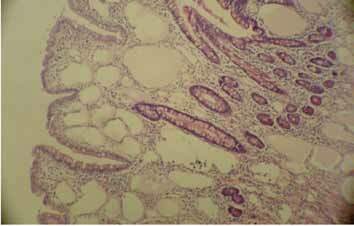 Also, skin and liver may be involved in hemangioma and it can have a vascular appearance in histopathology. These diagnoses were ruled out using histopathological exam. Also, Gorham’s disease was ruled out after performing a bone survey, which yielded negative results. Due to the rarity of the disease and considering the fact that the best therapeutic options for this disease have not yet been completely verified; in order to treat this patient, we used an option which was potentially most economically affordable and posed the least risk of complications. It is worth mentioning that currently, the response to treatment with propranolol has been very effective; and the patient did not suffer from diarrhea anymore. We consider that had complete resection of the tumor been performed, the prognosis would have been good. However, in the case of any problems during therapy or insufficient expected response, patient’s treatment will be changed to other options including corticosteroids, Gleevec and/or re-operation. Figure 3: Gross appearance, thickening of abdominal wall. Figure 4: Many dilated vascular spaces in intestinal mucosa (H&E × 100). Figure 5: Many dilated vascular spaces in bone marrow (H&E × 100). In summary, diffuse lymphangiomatosis is a rare disease which can involve soft tissue, bone and other viscera, and present as different clinical manifestations. Proper diagnosis requires a wide range of investigations and a high level of suspicion. Due to the rarity of this disease, different therapeutic options have not undergone comparison in clinical trials, there is not one best management option for such patients which can be easily determined, and the treatment options should be individualized according to disease severity and/or response to treatment. The current treatment plan for the patient is to continue propranolol and if necessary, adding/switching into other medications. 1. Bill AH Jr, Sumner DS. A unified concept of lymphangioma and cystic hygroma. Surg Gynecol Obstet 1965 Jan;120:79-86. 2. Rieker RJ, Quentmeier A, Weiss C, Kretzschmar U, Amann K, Mechtersheimer G, et al. Cystic lymphangioma of the small-bowel mesentery: case report and a review of the literature. Pathol Oncol Res 2000;6(2):146-148. 3. Takiff H, Calabria R, Yin L, Stabile BE. Mesenteric cysts and intra-abdominal cystic lymphangiomas. Arch Surg 1985 Nov;120(11):1266-1269. 4. Konen O, Rathaus V, Dlugy E, Freud E, Kessler A, Shapiro M, et al. Childhood abdominal cystic lymphangioma. Pediatr Radiol 2002 Feb;32(2):88-94. 5. Singh S, Maghrabi M. Small bowel obstruction caused by recurrent cystic lymphangioma. Br J Surg 1993 Aug;80(8):1012. 6. Alqahtani A, Nguyen LT, Flageole H, Shaw K, Laberge JM. 25 years’ experience with lymphangiomas in children. J Pediatr Surg 1999 Jul;34(7):1164-1168. 7. Losanoff JE, Richman BW, El-Sherif A, Rider KD, Jones JW. Mesenteric cystic lymphangioma. J Am Coll Surg 2003 Apr;196(4):598-603. 8. Méndez-Gallart R, Solar-Boga A, Gómez-Tellado M, Somoza-Argibay I. Giant mesenteric cystic lymphangioma in an infant presenting with acute bowel obstruction. Can J Surg 2009 Jun;52(3):E42-E43. 9. Hwang SS, Choi HJ, Park SY. Cavernous mesenteric lymphangiomatosis mimicking metastasis in a patient with rectal cancer: a case report. World J Gastroenterol 2009 Aug;15(31):3947-3949. 10. Chung JC, Song OP. Cystic lymphangioma of the jejunal mesentery presenting with acute abdomen in an adult. Can J Surg 2009 Dec;52(6):E286-E288. 11. Ozeki M, Funato M, Kanda K, Ito M, Teramoto T, Kaneko H, et al. Clinical improvement of diffuse lymphangiomatosis with pegylated interferon alfa-2b therapy: case report and review of the literature. Pediatr Hematol Oncol 2007 Oct-Nov;24(7):513-524. 12. Barbagallo M, Incorpora G, Magro G, D’Amico S, Pavone V. Splenic lymphangiomatosis associated with skeletal involvement (Gorham’s disease): a new case and review of literature. Minerva Pediatr 2009 Apr;61(2):231-236. 13. Chang SC, Tu SH, Shi MY, Huang SH, Chen KM. 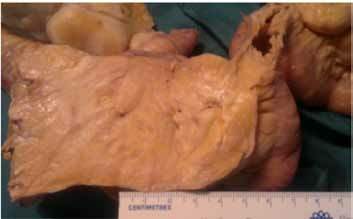 Mesenteric lymphangioma causing bowel obstruction: report of one case. Acta Paediatr Taiwan 2002 Jan-Feb;43(1):43-45. 14. Timke C, Krause MF, Oppermann HC, Leuschner I, Claviez A. Interferon alpha 2b treatment in an eleven-year-old boy with disseminated lymphangiomatosis. Pediatr Blood Cancer 2007 Jan;48(1):108-111. 15. Takahashi A, Ogawa C, Kanazawa T, Watanabe H, Suzuki M, Suzuki N, et al. Remission induced by interferon alfa in a patient with massive osteolysis and extension of lymph-hemangiomatosis: a severe case of Gorham-Stout syndrome. J Pediatr Surg 2005 Mar;40(3):E47-E50. 16. Grunewald TG, Damke L, Maschan M, Petrova U, Surianinova O, Esipenko A, et al. First report of effective and feasible treatment of multifocal lymphangiomatosis (Gorham-Stout) with bevacizumab in a child. Ann Oncol 2010 Aug;21(8):1733-1734. 17. Reinglas J, Ramphal R, Bromwich M. The successful management of diffuse lymphangiomatosis using sirolimus: a case report. Laryngoscope 2011 Sep;121(9):1851-1854. 18. Ozeki M, Fukao T, Kondo N. Propranolol for intractable diffuse lymphangiomatosis. N Engl J Med 2011 Apr;364(14):1380-1382.